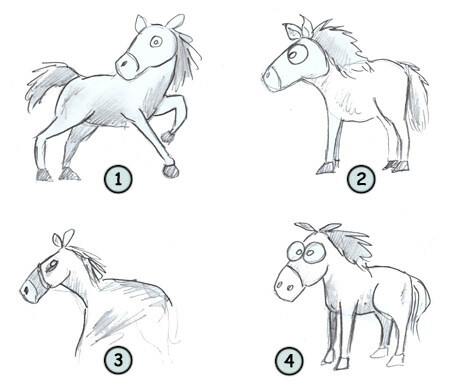 Drawing a cartoon horse: some fun facts before starting sketching! There are roughly 80 million horses in the whole world. A horse can stand on its feet almost immediately after being born. A horse will sleep around three hours each day. Take a closer look at the image on your left. If you hide the head and the neck of the horse, the rest of the body could belong to any four legs animal. 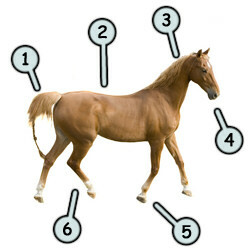 The head and the neck are the two most familiar and recognizable parts of the horse. It's really important to memorize those shapes. The body is made of a rectangle. And the back legs always have this little "c" shape even when the horse is standing still. Ok! It's time to try to draw a cool horse! Start by drawing a circle for the head and one for the body. Next, work the outline of the horse and join the two circles with the neck. Add another circle for the upper part of the back leg and four rectangles for the legs themselves. Once again, work on the outline of the legs and sketch the hoof. Finally, draw some details like the eyes, the muzzle, the crest and the tail. Drawing a good looking horse requires lots of practice (just look at number 2... not really convincing! Number 1 and 4 are much better!). You will need time and dedication in order to be able to draw a perfect horse. Just don't give up and take it one part at a time. Try to draw a nice head and neck and then move to the legs when you are ready! Happy drawing!